All eyes in the technology world are on Apple as it prepares to unveil its latest creation, amid a swirl of speculation it is a tablet computer. At 1800 GMT on Wednesday the company will hold a news conference in San Francisco to launch the new product. Media and tech blogs have been in overdrive, amid rumours the product will be a keyboard-less tablet device. For weeks, a flurry of photos and videos purporting to show the new device have been circulating. "One never knows what Apple might or might not do on any given Wednesday in January," said Mike Gartenberg, vice-president of strategy and analysis at research firm Interpret. "One thing we do know for sure is we are going to see some sort of new device or category of device." The safe money is on the product being a tablet or slate-like computer which traditionally bridges the gap between smartphones and laptops. "The question here is does Apple have a different take on this category? It has to be something that has a reason to exist all by itself and not something that lives between a phone and a computer," Mr Gartenberg told BBC News. Until now the tablet market has been regarded as a middling one with revenue of around $950m (£597m). But many industry watchers believe Apple will do for this sector what the iPod did for MP3 players. Apple has billed the new gadget as "a major new product"
Apple said it sold 21m iPods last quarter and, while that represented a drop of 8% on the previous year, the company boasts a 70% market share. "Our base case assumes the new tablet adds four million shipments, $3.2bn (£2.1bn) revenue and 82 cents of earnings per share in 2010, but we see potential upside to six million units," said Morgan Stanley analyst Katy Huberty. "Apple is not building products for tens of thousands of enthusiasts. They are building products for tens of millions of customers," he said. Speculation has been rife about what this mythical device, sometimes dubbed the "Jesus Tablet", will actually do. The closest followers of these trends are the blogs and so-called Apple fan sites which have tracked everything from patents to supposed leaks from various manufacturers and people claiming to have actual photographs. "Apple has done an amazing job keeping this thing under wraps," Paul Miller, editor of tech blog Engadget told the BBC. "We have just tracked eight years of rumour and speculation about a tablet device from Apple, and here we are the day before the big announcement and there is basically zero tangible information on it," said Mr Miller. 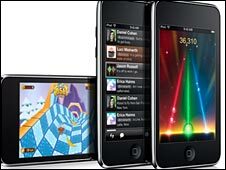 Among the rumours is that the gadget will be a gaming device, an "e-reader killer" or a really big iPhone. Multi-touch will be at the heart of everything. "Apple is looking at a new paradigm of user interface where the finger replaces the mouse and the keyboard," said Leander Kahney, founder of CultofMac.com and author of Inside Steve's Brain, a book about Apple boss Steve Jobs. "This is a very important step in mainstream computing." The tablet is expected to connect to the internet via Wi-Fi and 3G cellular networks. 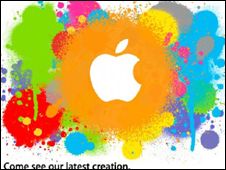 It will have a full browser and access to more than 125,000 software applications found in the Apple App store. In terms of partners, Apple has reportedly been talking to publishers to bring books, newspapers and magazines to the tablet as well as to broadcasters to bring TV shows and movies to users. Cost will be crucial and commentators say with an expected price tag of possibly between $700-$1000 (£440-£680) people could be put off. "We're betting even die-hard adopters [those who are first to embrace new gadgets] won't be showing up en masse to buy the tablet," said Wired blogger Daniel Dumas. For those interested in technology, the wait will soon be over. But not without Apple's boss doing his bit to whet everyone's appetite. Mr Jobs said on Monday: "The new products we are planning to release this year are very strong, starting this week with a major new product we are very excited about."